An important part of my work has been engaging with the schools and working with them to support teachers in their delivery of Art and Design. 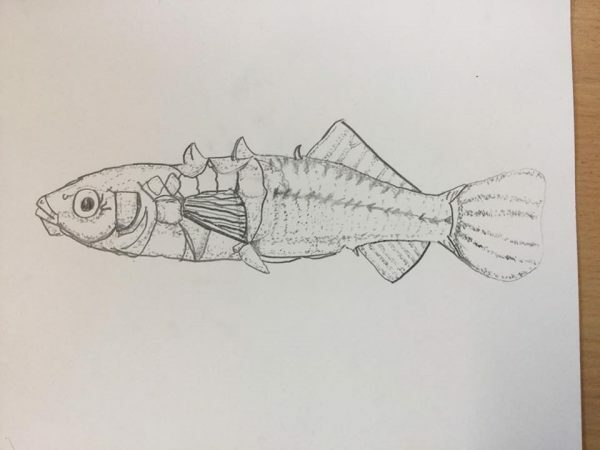 Since last august, I have delivered both stand alone sessions, designed to integrate with the class curriculum plans, and a special series of art classes focusing on the topic of: How the Stickleback Lost its Spines. 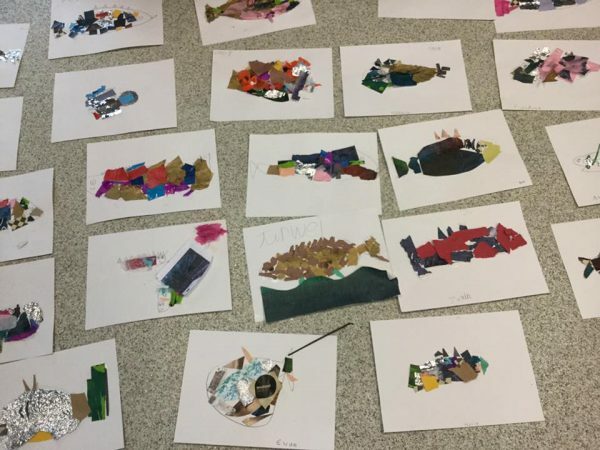 This Art & Science project was inspired by a talk given by Dr Carl Smith from the University of St. Andrews, where he spoke about how North Uist was the Galapagos of Scotland as far as the biodiversity of sticklebacks was concerned. Dr Carl Smith visited both schools and gave classes on the science behind the biodiversity of the sticklebacks, and on evolution. Carl also took the pupils out to local lochs to collect fish – they found a lot of sticklebacks in the lochs near the schools. Art and science work really well together, and these links have been stronger historically; finding ways of making STEM and the arts work together lends itself to encouraging an engaging learning environment which caters to all learning styles. Next term I’ll be working more on drawing skills with each school to ensure that the pupils have a good grounding in the basics and feel that they can draw, or at least have more confidence in their skills.